Having a door access control system is the ultimate security perimeter for your home or business. Access control security is often overlooked. With a majority of the emphasis being placed on the security surveillance cameras along with the DVRs (Digital Video Recorder) & NVRs (Network Video Recorder). TechPro Security Products has tested many different access control systems in the field. The DX Line by Security Camera King is by far the most reliable and user friendly door access control system. Door Entry Systems have a variety of methods into which you can gain access. An individual card that is tied to a specific person or an employee group. A fob which is generally attached to a keychain but alternate methods are employed too. Biometrics are widely used in highly secured businesses and institutions. Banks, Hospitals and jails require an extra level of security. The keypad method is the traditional method in which the previous three processes were developed from. Each of these four methods (Card Access Systems, Key Fob Security System, Biometric Security and Door Keypad) do the same thing. To provide around the clock control of all door entry systems. There are many options to choose from for your security access control systems. Door access control is not limited too only one type of access control for each security system. You can use a combination of these four methods at different entrance points. The DX Line by Security Camera King comes with a FREE powerful software that allows for viewing of all entry access. If you can operate a smart phone then you will be able to use your door access control system software. The number on entry points is almost endless from one all the way up through a thousand. 1000 is not your limit but purely a number. These Encrypted Access Control cards incorporate the high security PSK format. These security access control systems are widely employed in many government buildings, hospitals and financial institutions. Door access control systems have a variety of access control equipment which can be incorporated for your access control. The security readers are generally placed on each side of the door. One for entering the door and one for exiting the door. You can also use a light up push button that goes from red when the door is locked and changes to green when depressed to allow exit access. Think open sesame but you are in control not Ali Baba. Security door locking mechanisms can be used in combination with your door access control. An electronic door strike or electromagnetic lock can be combined in tandem with alarms and sirens too. Fingerprint access control or biometric access control enables your security access control system to have complete accountability. All four types of access control (Card Access Systems, Key Fob Security System, Biometric Security and Door Keypad) give you a reliable security solution depending on the level of security your building or home requires. Card access control systems and door keypad access control can be manipulated in an unscrupulous manner. Even if a card is lost or stolen no worries. Through the software you can control the hours of access. The best part about a door access control system is that you can control the times during which someone can access the building with their fob, card or keypad. Basically if you don’t want someone in your building during non traditional hours then entry is not granted. So even if a disgruntled employee or house guest has gotten a hold of your fob or card they can’t gain entry. TechPro Security Products has a full range of proven security surveillance products which can help you secure and protect your family or business. 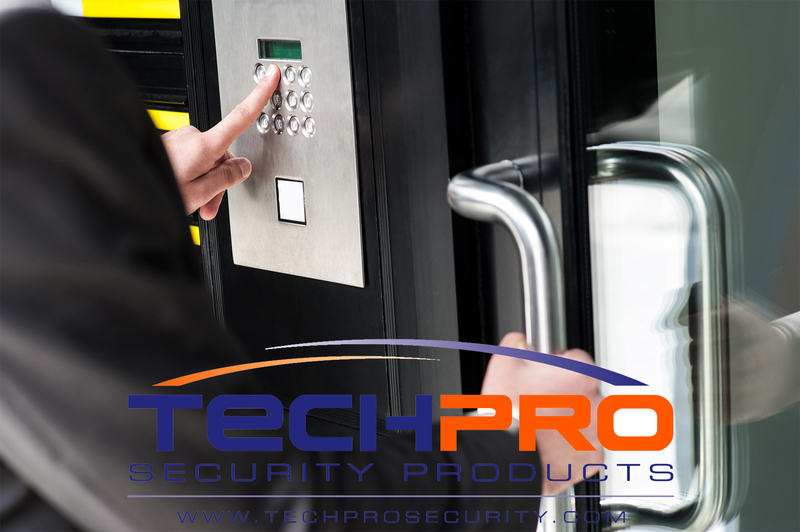 Both of TechPro Security Products facilities utilize these door access control features for over thirty separate employees using various types of access.